The first thing to give thought to when you open a savings account online are your savings goals, as they might well affect your choice of account. If you are looking to save a lump sum in order to earn an income, then a fixed rate account might well be the right option. This is because you will likely want the security of knowing exactly how much you will receive each month. If you are saving for something like a house deposit, however, then there are things you may want to consider before tying your money up. What if there is a sudden dip in house prices due to a financial shock? Might you want to get your hands on your money more quickly than you thought to grab a bargain? What if you were to receive a financial windfall from an inheritance or some other source? Would you then have enough money to put down on a house when you combine it with your savings? There are many reasons why people save money. What we are saying is to think seriously about what the future might bring before tying up your cash. Will you have enough for emergencies? The second thing to consider is whether you will be leaving yourself with enough cash to withstand a financial shock or emergency. Imagine you have £5000 in savings and you are considering putting it all into a fixed rate savings account. Would you have enough in reserve to cope should your boiler or car break down? There are many emergencies that can happen in life where you may need quick access to your savings. The key is to think seriously about this possibility before putting your money into a fixed rate product. It may be that the penalties for early withdrawal from a fixed rate product may not be too bad. If that is true, then perhaps you don’t need to worry too much about the above points. What if the penalties for early withdrawal on an account are quite hefty, though? This might mean you have to think more seriously about what could happen in the future. It might also be worth looking around again to make sure you’ve seen all of the best options available. There may be something out there that allows you to have the best of both worlds. Some current accounts, for instance, come with high interest rates on balances up to a certain amount. There will likely be conditions attached to the account but it is certainly worth considering. If you’ve decided that you don’t mind tying your cash up for a longer period, then you might want to invest your money instead. Or, if you’re saving for a house or retirement, then you may want to check out the OneFamily Lifetime ISA. Lifetime ISAs come with a 25% annual top up bonus from the government. This makes them a great option if you are saving for a home or for retirement. As Lifetime ISAs are usually investment products, your capital might be at risk. The same is true with other investments too. As we have seen, when you open a savings account it’s important to think about which type of account is right for your circumstances. If you won’t have much of a financial buffer, it might not make sense to commit your savings long term. This is especially true if the product has hefty penalties for early withdrawal or even doesn’t allow early withdrawals. After all, the last thing you will want to be doing is racking up debt on a credit card and paying interest on it while you are waiting to withdraw your savings. If you will still have money in reserve, however, then a fixed rate account might well be the right choice. Just don’t forget to explore all available options to make sure you’re getting the best possible return. 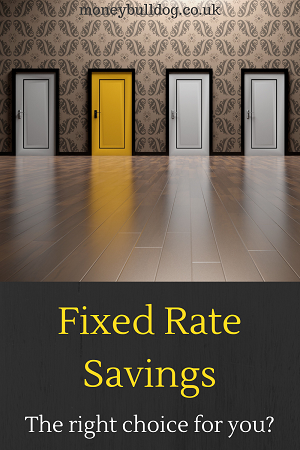 One Response to Fixed Rate Savings – The right choice for you?